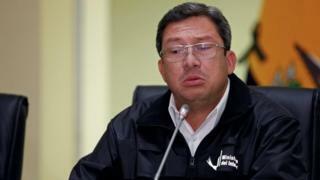 Ecuador's Interior Minister César Navas says the government has been sent a video showing a couple who have been kidnapped by members of a dissident Colombian rebel group. The video comes just days after the government received confirmation that two kidnapped journalists and their driver were killed by the same group. In the recording, the couple ask President Lenín Moreno for help. Authorities named them as Oscar Efrén Villacís and Katty Vanesa Velasco. They come from Santo Domingo de los Tsáchilas, a province in north-western Ecuador. The couple, who have ropes around their necks and whose hands are tied, can be seen pleading with President Moreno to help them so that they do not suffer the same fate as the journalists. Mr Navas showed the video at a news conference on Tuesday morning. He said officials had received the video "via a communication channel with Guacho" on Monday evening. Guacho is the alias of Walter Arízala, a former member of Colombia's Farc rebel group who broke away from the guerrilla movement after it signed a peace deal with the Colombian government in 2016. Guacho has been leading a gang of about 70 to 80 combatants in the Ecuador-Colombia border area for the past two years. His group, which calls itself the Oliver Sinisterra Front, last month kidnapped two journalists with Ecuador's El Comercio newspaper and their driver. Two weeks after they had been seized, the Oliver Sinisterra Front released a statement saying the three had "died" when the army came close to where they were being held. Their killing caused outrage in Ecuador, which had been largely untouched by the armed conflict that blighted Colombia for decades. In response, both Ecuador and Colombian stepped up their hunt for Guacho and last weekend Ecuadorean security forces arrested 43 alleged members of the gang. Mr Navas said that Guacho had demanded the release of those captured in return for freeing the seized couple.